In the recent Jing’an District high rise fire, at least 53 people were confirmed dead, 70 injured, and many still missing. This disaster will spark major reforms in building standards, fire safety, emergency responses, and building responsibilities in China. Chinasmack.com has translated the Chinese NetEase article on this incident, including the comments posted, into English to gain insight on what the people of the PRC are saying. This is not to say that the Chinese actions or the people’s responses are right or wrong, but rather it is evaluate China’s current standards and practices in the housing and construction industry from various points of view. When the fire broke out, there were many people still living inside because the building was only undergoing repairs and renovations. Firefighters and firetrucks rushed to the scene to put out the fire, but many of the firetrucks could not reach past the 10th floor. It was not until hours later did another firetruck with the appropriate equipment come to put out the fire on higher floors. One would think that with Shanghai’s megablocks of high rise towers, there would be more adequately equipped fire trucks that could reach those heights. Who started the fire then? Cheung Jiulong, head deputy of Shanghai police, stated that 8 individuals would be charged with the responsibility for the accident, and blamed the sparks from illegal welders as the cause of the fire even though the building wrapped in highly flammable nylon mesh. Perhaps blaming others or hiring legitimate welders may have lightened the severity of the situation, if this incident had not occured, China would not have even acknowledged the large group of illegitimate construction workers that are constructing skycrapers and housing towers now. If construction reform occurs, developers have uphold better building standards by hiring legal workers, but at higher costs. Consequently, that will affect the cost of the complex, but the demand for housing will still be there. The construction regulations have also been lax especially with housing towers because this high demand. People living in the complex expect to have a maintained safety egress in emergency situations. However in China, any unusable area can be used for further profit after the building is checked. Developers allow tenants to use the fire stairs as additional storage space or even rent the space out as a room. Because the fire stairs have taken on this additional program, developers have put their tenants’ lives at risk. The building materials used in fireproofing is also another issue that the Chinese government has to address. 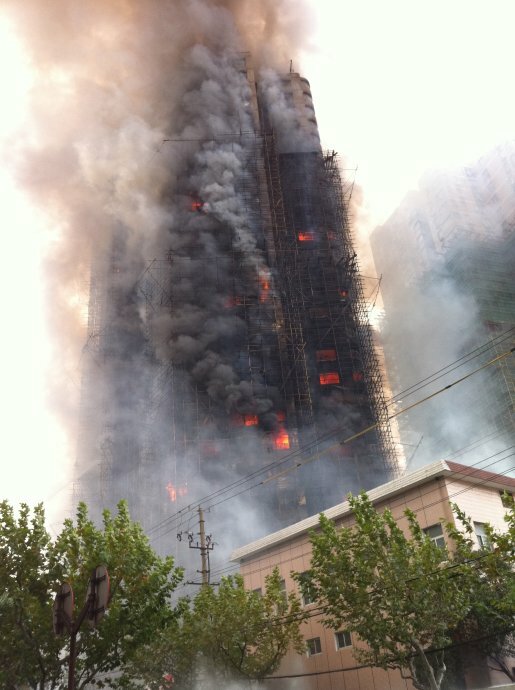 Developers are very likely to use the cheapest materials to quickly get the job done, and in incidents like the Jing’an fire, use unsuitable materials and inappropriate construction techniques that has cost many people their lives. The nylon fabric wrapping the high rise was a highly flammable material that fueled the inferno. However, the buildings that are currently in construction still use it because these regulations have not undergone safety evaluations. China’s reaction to the event by arresting the illegal welders is a minute issue compared to the larger problem of building safety and housing standards. It is understandable that China is still developing, but it has nations like Japan, Korea, and the United States to use as precedents in construction techniques and safety standards. However, it will be up to the Chinese government and other officials to reinforce the new changes in building and safety codes so that another incident like this will have a better outcome.